In order to be faithful to our calling and to maximize the opportunities that God has opened to us, the Lord has led us as a church to launch a new initiative that we are calling ADVANCE. 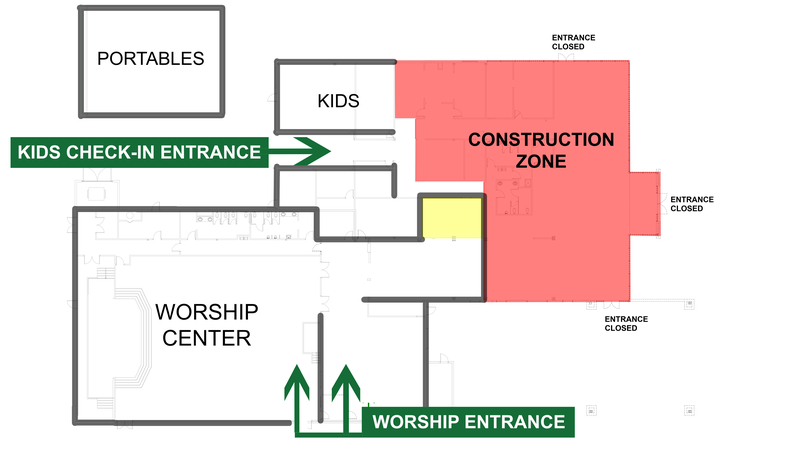 In June 2017, we began construction in our building to help us create space to reach more people in our community. 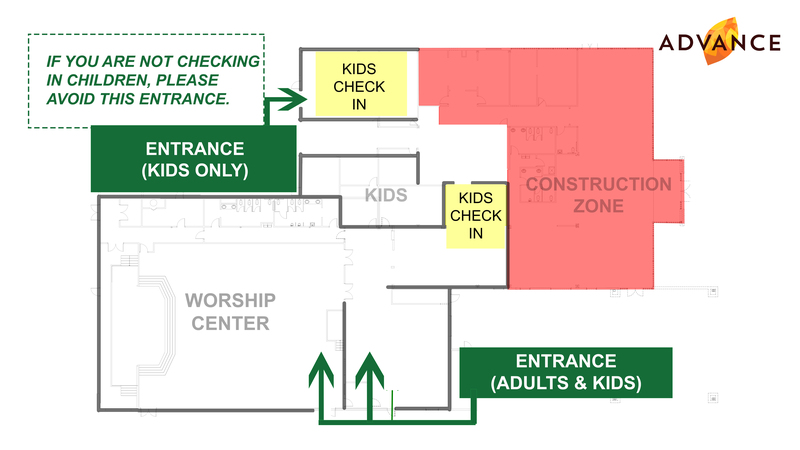 If you take a look at the map on the left, you'll see that construction impacts our Sunday morning services by moving our main entrances to the south side of the building and the kids check-in stations to various points. Please email info@providencefrisco.com with any questions. We believe we are at a pivotal point in the history of our church. We just celebrated 10 years. We have seen God move in huge ways as we have had the privilege of baptizing many, planting churches, and expanding our community group ministry. We just experienced our two largest Sunday morning gatherings in the history of our church. Providence Kids continues to grow, and we're reaching more kids than ever with the gospel. The vision of Advance is to see the Gospel and the Kingdom of Jesus Christ advance in our world. In an era of drastically shifting cultural norms, we believe that the good news of Jesus Christ remains the hope for the world. Jesus Christ is the same yesterday, today, and forever (Heb. 13:8). Jesus is the answer for every longing of the human heart. Our desire is to see his gospel Advance in our community (VIDEO), around the world, and in the next generation (VIDEO). We long to see more disciples made, churches planted, and more missionaries sent. This is the motivation for Advance. We are calling you, the people of Providence Church, to prayerfully consider making a one-time gift on November 15 and then letting us know what you are willing to give above and beyond your normal gifts to the church over the next three years. We believe our greatest days of impact for Christ are yet to come! Give now online (under Giving Opportunities, choose Advance Initiative) or by noting on a check that you are giving to Advance. Before the Advance Initiative, we carried a debt load of $4.6 million on our building, resulting in paying around $34,000 a month to service our debt, which severely restricted our ministry potential. Thanks to those who sacrifically gave toward Advance, we were able to refinance our debt and significantly decrease our interest rate. This freed up $11,000 in our monthly budget to be used for ministry purposes. As we steward the resources of Providence Church, we have always sought to give away a portion to missions, ministry partners, and church plants. Therefore, part of the funds that come in from Advance will be given to further our reach with the gospel worldwide. It has been so exciting to see our church send missionaries to Indonesia, Turkey, North Africa, and Thailand. Advance will enable us to see more churches planted and more missionaries sent, so that the Kingdom of God will advance to all corners of the earth.